If you’re planning your vintage wedding, after choosing the venue and, of course, the wedding dress itself, you’re probably thinking about how you’re going to decorate your space. While some couples choose more modern decorations, if you’re going all the way with your vintage theming you’ll want to incorporate more traditional ideas in your venue. Let’s take a look at some of the best ideas to bring some old-fashioned elegance and glamour into your day. 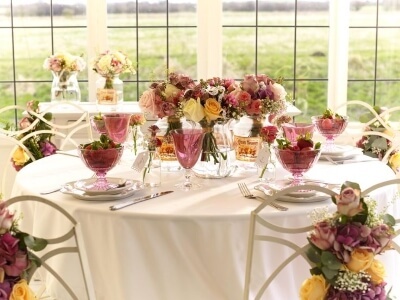 Your wedding breakfast table is where you can really go to town with vintage theming. 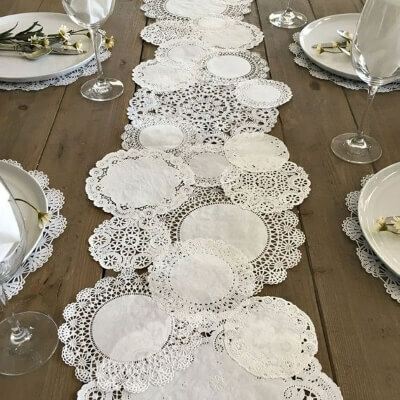 Perhaps one of the best accessories to include is an intricate, delicate lace runner for the centre of your table. This will immediately transport your guests to a more sophisticated bygone era. You can then add other traditional accessories such as polished brass or silver candlesticks (perfect for an evening sit-down reception or winter wedding), silver pedestal bowls filled with sweets for after the meal, decorative glass or silver vases filled with blossoms to match the bride’s bouquet, and, of course, the centrepiece – an ornate classic glass cake stand for your wedding cake creation. Whether you’re marrying in church, in a hotel or in a vintage venue, there are lots of ways to incorporate vintage décor into the ceremony itself. Churches lend themselves well to traditional theming, and a hand-tied pretty floral bouquet attached to each pew-end goes a long way towards giving even the most modern church an old fashioned look. If you’re marrying in a more modern hotel, there are still ways to embrace traditional décor. Using cleverly draped fabrics is a simple but effective way to make the space look more traditional. Lanterns are a wonderful way to add atmosphere in seconds and also to make any venue look antique. Quick and easy to put up, using traditional lanterns, either with real candles inside or (for a safer alternative) with battery operated candles that have a natural flickering look. This is especially effective if you’re arranging a winter wedding or if you’re holding an evening reception. Hanging lanterns from the ceiling as well as putting them on each table and on windowsills will add a warm and welcoming glow to any space. 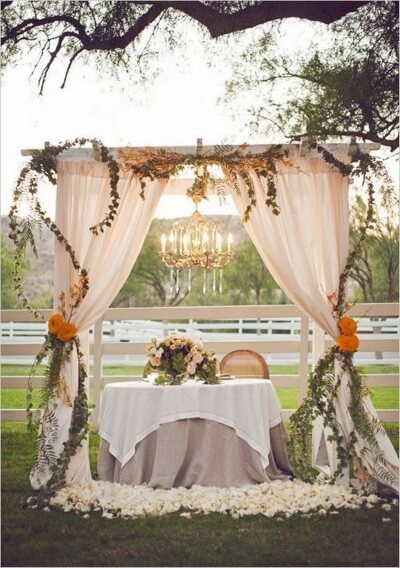 One of the best things about a vintage wedding is that often the key is simplicity. In the past, traditional weddings were kept fairly simple, with lots of fresh flowers as the primary decorating tool. You can easily harness this trend in your own big day. You could even dispense with any other decorations and opt solely for flowers. Go for a rustic look with wildflower hand-tied bouquets, or choose the same flowers as the bouquet strewn across tables, in large decorative standing vases around the room and on the chair backs. You can bring vintage glamour to your wedding in moments simply by using one simply accessory -the doily. Whether paper, fabric or lace, doilies look wonderful as so many elements of special wedding. Try draping over the chair backs for an old-fashioned look, or a long doily table runner to decorate your wedding breakfast service. Small paper doilies can decorate your guests’ party favours or you could even put your favours into pretty little lace doily bags tied with string or ribbon. Paper doilies turned into a cone are perfect for filling with flower petals for your guests to shower the bride and groom as they leave the church or when taking wedding photographs. 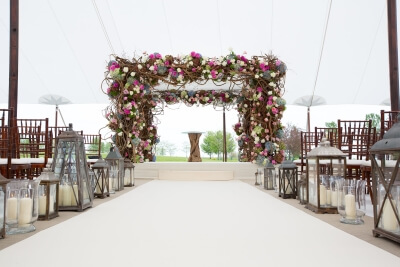 Incorporate tradition with vintage elegance with a beautiful wedding arch. Not only will it look beautiful in your wedding photos, it also captures tradition and heritage in an elegant way. 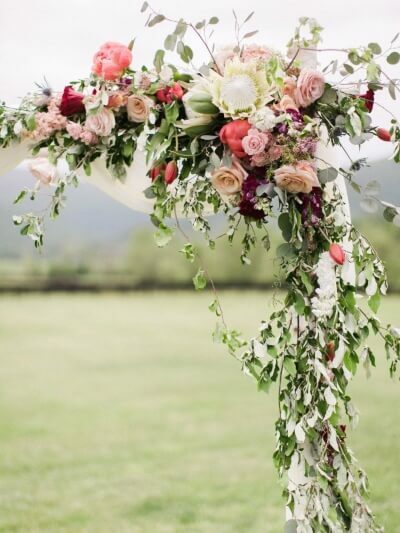 Made by winding leaf-strewn branches around an archway and the decorating it with flowers and small lanterns, it will quickly give any wedding day an old-fashioned look. These are just some of our top ideas for vintage themed wedding décor. 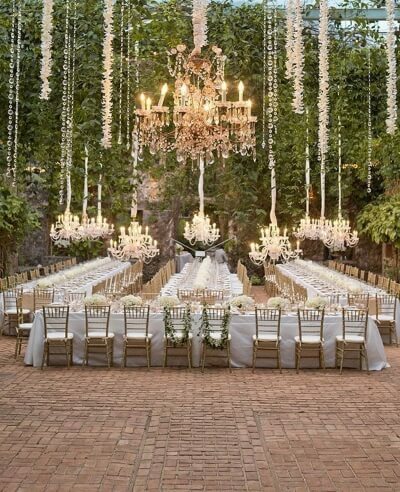 We hope you’ve been inspired by this post and that you find some brilliant suggestions to make your venue look perfect both inside and out on your most special day.